In the new movie from Disney, the animal kingdom has turned into an animal republic. 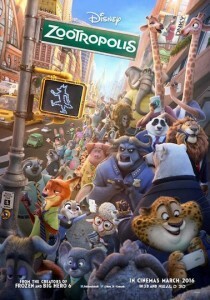 Welcome to Zootropolis: a twinkling, Corbusian bliss where the old predator/prey logic does not apply anymore. Judy Hopps (Ginnifer Goodwin), a bunny police officer teams up with a streetwise fox Nick Wilde (Jason Bateman) to find a missing otter. The animation teams excels expectations with the fabulous personification of each animal’s characteristics. Ginnifer Goodwin, who voices Judy Hopps, exhilarates her scenes with the tangible exuberance and speed which we link to the rabbit family. Her partner in crime, Jason Bateman as Nick Wilde ideally embodies a canny fox, delivering his lines with the dry cynicism that saw him succeed in Arrest Development. Idris Elba, encloses the bullish and brutish characteristics of the Cape Buffalo, Chief Bogo. 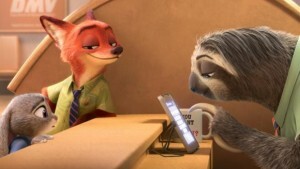 Zootropolis is full of jokes for both adults and kids in the audience, like the multiplying population of bunny town and DMV office staffed entirely by sloths. Shakira voices the minor character, Gazelle. She also sang the song ‘Try Everything’ for this movie. This is must watch movie for comedy lovers. I don’t have a favourite character, but I love the duo of Nick and Judy. The way they depend on each other to solve the mystery is very fascinating. 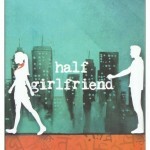 Have you watched this movie? Let me know what you think about this movie! A very funny movie to watch.